Labour hopes to encourage communities to organise around local issues and develop campaigns with a new team. The unit - which gets up and running on Monday - will target seaside towns and traditional Labour heartlands, where the party needs to rebuild support. 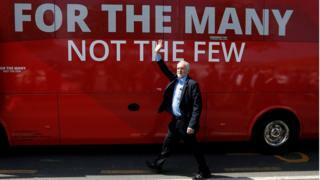 The strategy is designed to help Labour make inroads in the dozens of seats it needs to win to get into power. Leader Jeremy Corbyn said he hoped an approach of "empowering people" would "further invigorate" his party. Mr Corbyn has styled his party as a social movement rooted in communities. Despite performing better than expected at last year's election, Labour still must attract significant new support across the country to be able to get into government. The new community organising unit will work with constituency Labour parties and trade unions to try to help them build alliances beyond the party and to campaign on key local issues. Labour says that through this approach, communities will be able to bring about changes in their local area without having to wait for an election. It points to payouts given to customers of rent-to-own firm BrightHouse after a campaign by Ed Miliband in his Doncaster constituency as one successful example. The former Labour leader had also championed the idea of community organising. This is the first time the party has poured resources into a dedicated central unit, which will initially have around a dozen staff. "We will empower people to campaign and win in their communities and workplaces on issues that matter to them," said Mr Corbyn. "By organising more effectively with communities across the country, not only can we build support to help Labour win elections… we can make real, practical differences to people's lives, even while in opposition."